Situated on the coast near Pwhelli in the town of Llanbedrog, Plas Glyn y Weddw is a huge Gothic mansion which houses a gorgeous modern art gallery, woodland walks, a Cafe with indoor and outdoor seating, and a quite spectacular view of the Irish Sea. Now, that;s what I call a view! 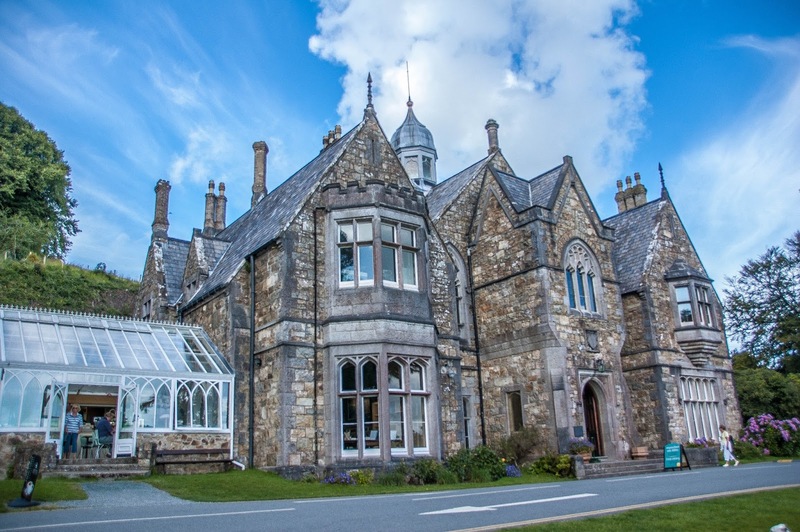 As we continue looking for places to explore in North Wales, we spotted Plas Glyn on a Trip Adviser list and decided we’d roll on by and take a look. We arrived on a warm and sunny Saturday afternoon and were immediately taken by the mansion house and beautifully manicured gardens. 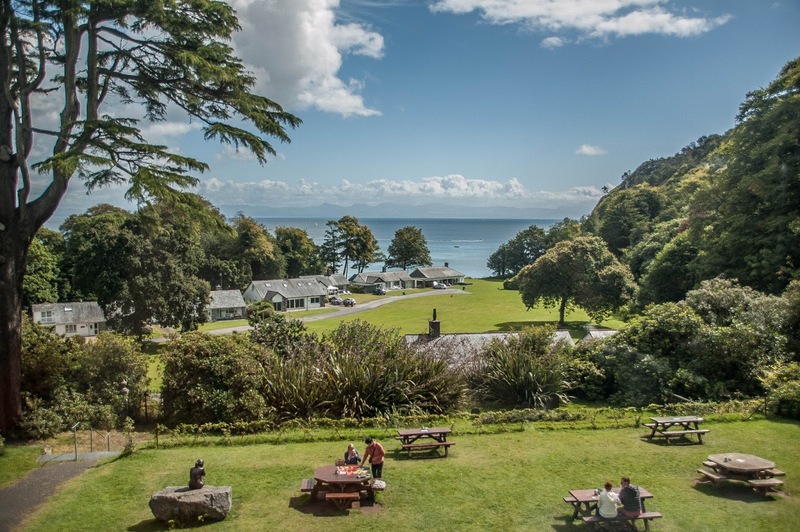 The rhododendrons were a riot of blues, whites and hot pinks and several couples and their lovely dogs were already sitting out on the lawn picnic tables reading maps and newspapers and drinking coffee. I immediately wanted to go and speak to the puppies, but I’m always worried their humans will think I’m odd, so I managed to restrain myself. I did stare at them a lot, though. There is a small car park on site, which is free of charge for the first half hour and only £1 for each subsequent hour. Given that the gallery and exhibitions are all free of charge, it’s an absolute bargain. As I’m no use to anyone without my morning coffee fix, I dragged LT into the Cafe with the promise of tea and cake. The staff was mainly made up of young girls, who were friendly and efficient, delivering their trays of home bakes to salivating customers. LT wolfed down some sort of raspberry strudel which disappeared in a matter of seconds. If that’s not confirmation of how tasty it was, I don’t know what is. The entrance way to the main gallery is really impressive, with high vaulted ceilings and stained glass windows. 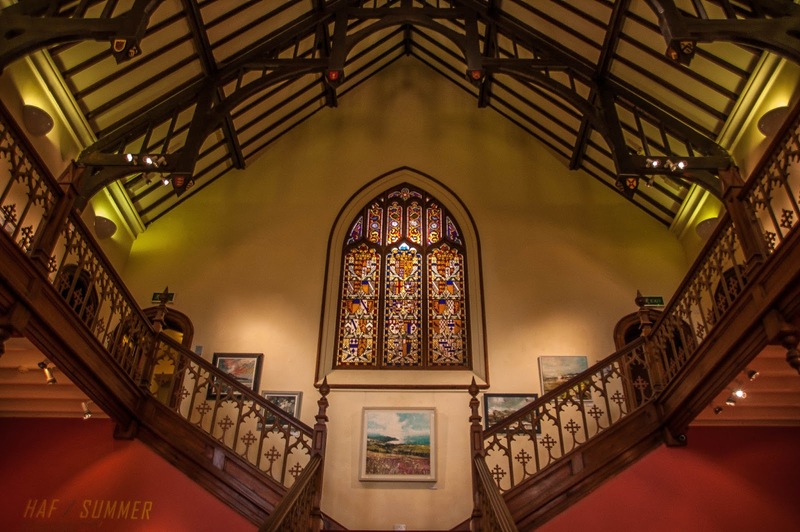 It was brilliant to see so much local art and, as this is the first time I’ve been to a gallery in Wales, I was really impressed by the talent on display. Obviously, I also managed to sniff out some Scottish artwork in the shape of piggy banks. I think this helps to reinforce the stereotypes about Scots and, shall we say…their love of not spending money. Clearly, this isn’t true as I spent a pound on the car park. A WHOLE POUND. I feel I’ve made my case. We spent an amiable hour, happily wandering through the floors of the gallery, stopping occasionally to gaze out of the upper windows at the green seas in the distance. After looking through the ‘Haf’ exhibition (Welsh for summer), we took ourselves down the gallery shop to stick our snouts in the locally made candles and ooh over the hand crafted handbags (well, I did, anyway) before heading back out into the sunshine to check out the woodlands walks. There are several walks to choose from, each marked with the cutest signpost (as pictured below). 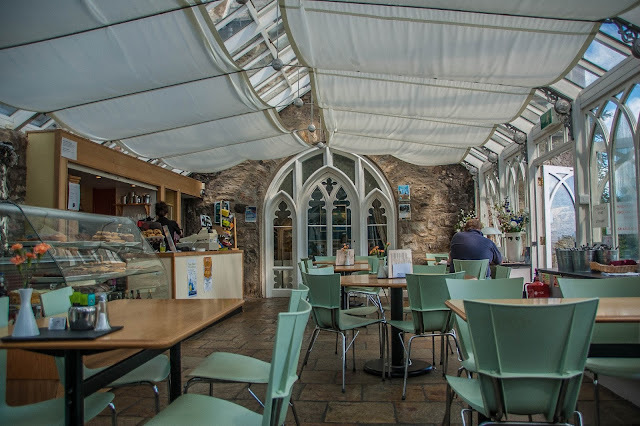 The woodlands surrounding the mansion are lovely and, as we walked towards the main bulk of trees, we noticed that the outbuilding towards the car park also has a roof terrace, which visitors can use as a further open space to relax in.